Are you looking for a dependable, reliable, and easily maneuvered hand pallet jack? Lift-Rite's® PST PLUS Electrically Powered Hand Pallet Truck is the answer. 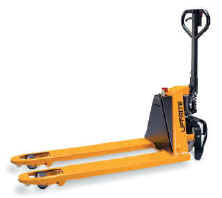 It has everything you expect in a standard hand pallet truck, but it is self-propelled by an electric motor easily controlled from the steering handle. The two-button motor controls make it easy for the operator to concentrate on precision steering in tight places. These features, along with a compact design makes this the perfect pallet truck in cramped quarters. the PST PLUS™ is the ideal transport medium for supermarkets, hospital corridors or distribution warehouses. Estimated operation time in continuous use: 2 hours with full load 2,200 lbs. Drive wheel, polyurethane, 7"x2" - Load rollers 3.3"x4"
Due to Lift Rite's® continuing product development program, specifications are subject to change without notice.